For those of you in the holiday spirit, take a trip down the Pacific Coast Highway to the Huntington Harbour. On December 13 and 14 they will have the 52 annual Huntington Harbour Boat Parade, themed “Music in Paradise” this year, kicking off the annual event, The Cruise of Lights. From December 17 to the 23, take a ride on a boat through the harbor and see the entire glory. Hundreds of boats, decks, docks and homes decorated in thousands of lights all through the holiday season. 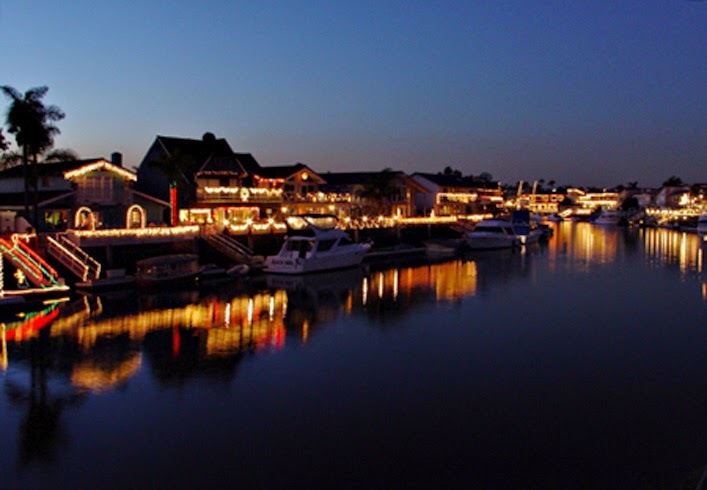 A 45-minute narrated boat tour through the sparkling waterways of Huntington Harbourwill take you what is called one of the most remarkable holiday light shows on water and voted Top 10 by Coastal Magazine. And while you are there, stop into the Red Table Gastrobar, with their edgy interpretation of comfort food. The menu is comfortably priced with interesting yet approachable items intended to share and savor. Craft beers and outstanding wines have been selected to compliment the distinctive menu items and enhance the dining experience. The tours leave from the parking lot of the Huntington Harbour Mall. For more information visit the HuntingtonHarbour Boat Parade, The Cruise of Lights and Red Table on their websites. Pictures courtesy of The Cruise of Lights.